Willy Schwarz composed the original music for Mary Zimmerman’s METAMORPHOSES, for which he won the 2002 Drama Desk Award for Outstanding Music in a Play. After it’s initial Chicago run was extended by popular demand, the show moved on to Seattle, Berkeley, Los Angeles, and New York. After winning two Tony Awards for the Broadway production, it was subsequently presented in St. Louis, Cincinnati, Hartford, Kansas City and Melbourne, Australia. 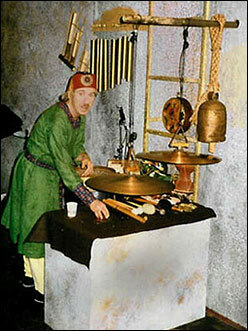 Onstage in Mary Zimmerman's "Journey to the West", Berkeley Repertory Theater 1997. Other collaborations with Ms. Zimmerman include THE ODYSSEY, for which he received the 2000 Joseph Jefferson Award for Original Music, and JOURNEY TO THE WEST, which won him the the Bay Area Critics’ Circle Award for 1997, as well as THE BALTIMORE WALTZ at Chicago’s Goodman Theatre. Other Chicago credits include GOOD PERSON OF SZECHUAN, A WINTER’S TALE, ROMEO and JULIET, and A CHRISTMAS CAROL at the Goodman Theatre. For Steppenwolf Theatre he served as onstage music director for the La Jolla, London and Tony Award – winning Broadway productions of THE GRAPES OF WRATH, and composed for and appeared in A CLOCKWORK ORANGE and EVELYN and the POLKA KING. At Victory Garden he performed in MICHAEL,MARGARET, PAT and KATE, and composed the score for UNDERGROUND at National Jewish Theatre. For Court theatre he composed and performed in FUENTE OVEJUNA, ELEKTRA, MYSTERY CYCLE: CREATION and MYSTERY CYCLE: PASSION. He composed the music for Seattle Repertory Theatre’s MIDSUMMER NIGHT’S DREAM, and has served as music consultant for the Premiere run of August Wilson’s SEVEN GUITARS, and for SHARP SHOOTER at Mad River Theatre in Ohio. Willy has toured and performed with such diverse artists as Tom Waits, Theodore Bikel, Ravi Shankar, David Amram, Robert Bly, Shlomo Carlebach and Leon Russell. His solo CDs LIVE FOR THE MOMENT and HOME; SONGS OF IMMIGRANTS, REFUGEES AND EXILES received highest critical acclaim in Europe, and the CD ‘METAMORPHOSES and other plays directed by Mary Zimmerman’ was issued by Knitting Factory Records in 2002.